Bits & Scraps Of My Life: Ok....where in the heck did January go????? Ok....where in the heck did January go????? I've got LOTS of rambling to do today.....so this is your warning, run now before I realize you are even here !!! Use your scraps, your packaging, ribbon from gift bags,........get creative!!! I know you can!!!! And while it's on my ind we also have our "Talented Tuesday Tutorial" up today featuring a cool paint technique from Haven!! Whewwwww!!! Say that one 3 times real fast!!!! Take a moment to hop over to her blog and send some hugs and kind words her way.......she has had a rough few days!!! Thank you Creative Inspirations!!!! MUAHS!!! 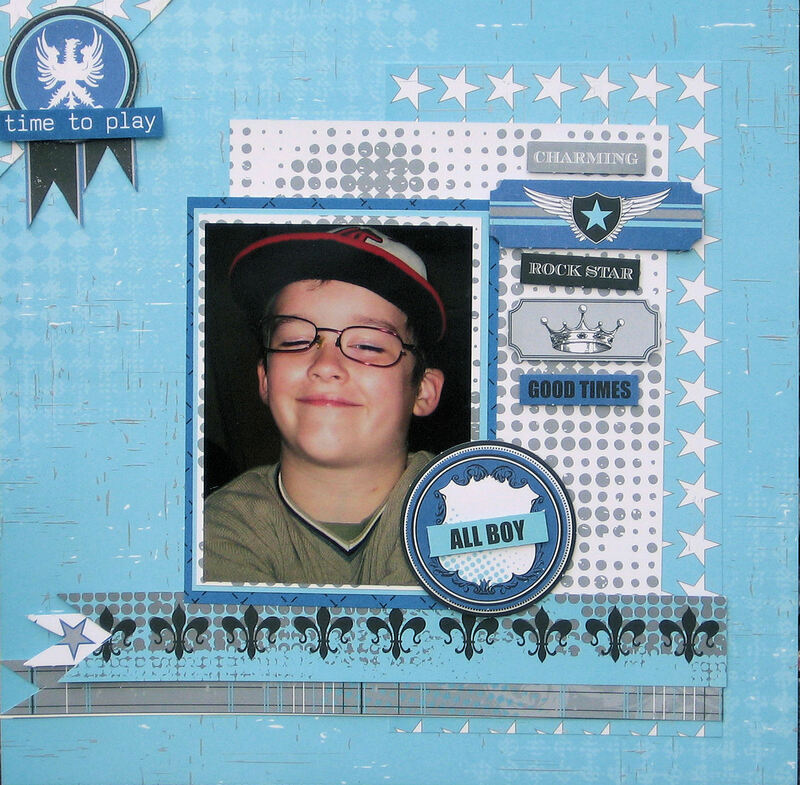 AND............I have a layout featured today at Practical Scrappers!!!! I'm linking the post so go over and take a look and leave a comment and make it look like I am someone important.....lol. Now, will someone PLEASE tell me what happened to January????? Is this not supposed to be winter????? Well today it is sunny and 63 degrees..........and not that I am complaining but check it out..........flowers are actually budding in my yard!!!! WHAT?????? 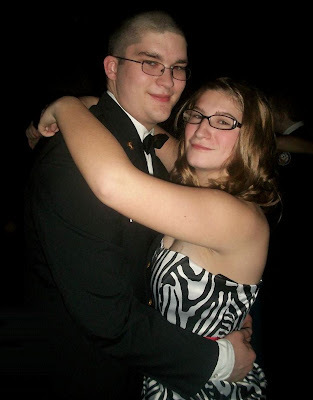 Over the weekend Jacob and Steven had their NJROTC Military ball. I was THRILLED that Steven wanted to go.......he's a freshman, not really a social kid at all, no date......but I was proud of him :):) He didn't really enjoy it tho. Dances are just not his thing. He'd rather be at home watching a ball game or playing Xbox.....lol. He hung around with Jacob a lot....but Jacob had a date and didn't like that very much. Ohhhhhh well!! The joy of having brothers......lol. Here's a shot of them at the house getting ready to leave, all dressed up in uniform......handsome boys!!! Yeah lovely........even at this age they don't know how to act when you take a photo!!! GRRRRRR!!!! You can barely see Matthew in the background,...I think he ran off to bed shortly after that.......lol. Wayyyyyy to rowdy for an Autistic kiddo to deal with!! One more shot of Jacob and his latest girlfriend Kelsey.........I think..........I can't even keep track any more. I keep saying I will NOT befriend any more of his girlfriends or their moms cuz when I do it's really awkward when they break up. Which at age 16 he does frequently.......lol. And Jacob wanted me to take a photo of his medals........he is incredibly proud of then and his rank of Chief Petty Officer!!! In fact, he has been recommended for Leadership Academy this summer!!! I don't know all the details yet, but it's a huge deal!! I'm very proud of ALL of my boys!!! Pardon the ramblings of a proud mama!!! I've had these papers for a while, just never had a chance to work with them. I think the line is called Whooligans. A funfunfun Halloween line!!! The colors are incredible!! 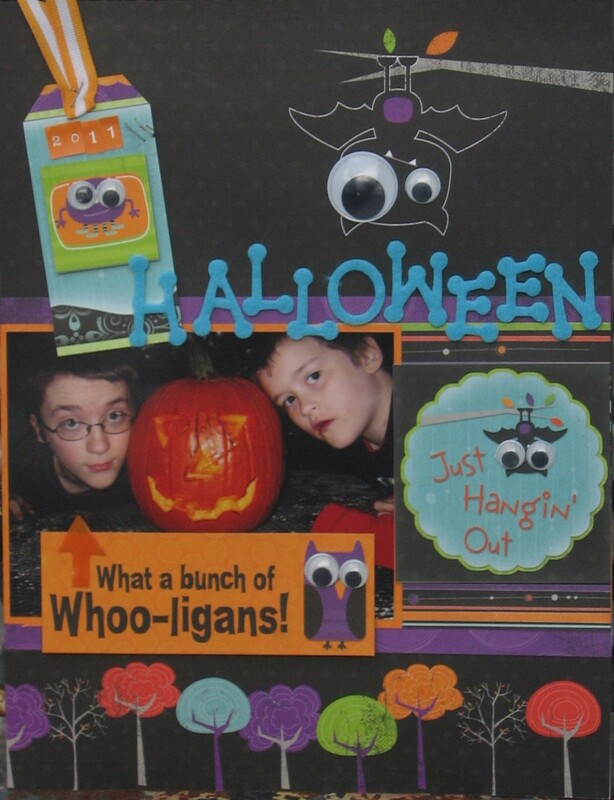 I had a chance to scrap some of my Halloween photos......I am not a chronological scrapper AT ALL!!! I may have taken some liberties with it but hey..... that's what sketches are for!!! it was the inspiration I swear!!!! Pinky promise even!! 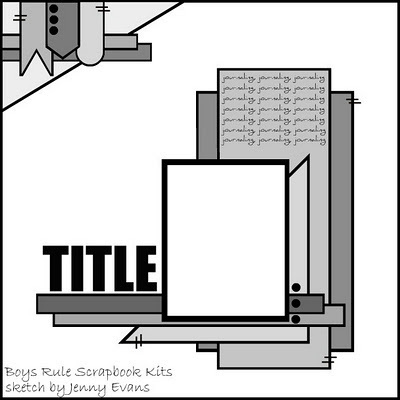 Next is Boys Rule Scrapbooking and their VERY first sketch challenge!!! They are a newer scrapbooking kit club that caters to boy themed kits.......and we all know I have a houseful of those boogers......lol. Kinda cool because it's not always easy to find cool boy stuff.....a lot of it is way too cutesy for older boys or teens. I'm not a kit club member and luckily that isn't a requirement to play along! Yayyyyyyy!!! The sketch......which I think is uber cool!!! And my take......I didn't like it at all when I completed it last night but today i love it!!! And love those papers by Teresa Collins too!! That's Jesse in his "Jacob" costume at Halloween........my kids are odd.......lol. He wanted to be his big brother....which is sweet :) He is wearing a pair of my old frames with the lenses popped out. He was sent home friday with a fever of 102 and I hugged him up and called him baby doll.......he just looked annoyed and said "Mommmmmmmm.....I'm not a doll!!! I'm a BOY!!!!" BTW....he is doing better......he has an ear infection and we might have to go back tgo have it rechecked.....he had mastoiditus back a few years ago.....which is basically when the infection spreads to the bone behind the eardrum....which is called the mastoid. Not a good thing to get because ultimately it CAN go into your brain!!! he was VERY sick when he had it and he is saying that it hurts behind his ear.......the dr thinks it is just fluid but if he isn;t better by Friday it's back to the dr I go.........so keep him in your thoughts please!! I'm sure he will be just fine since he is playing and acting silly but you know mom;s can be!!! That's about it!! Nothing fabulous going on here the next couple of days.......just running kids to drill meets and rugby games. Hopefully somewhere in there I can get some sort of grip on my laundry and get some creative time too!! It;s good for the soul and if I am having a bad day I will craft over doing laundry anytime.....LOL. Y'all have a good one and thanks so much for stopping by!! Handsome boys indeed!! Glad you did the proud maomma thing, love seeing these photos!! Hope jesse is feeling better. Great pics of your boys and fabulous layouts. WOW! 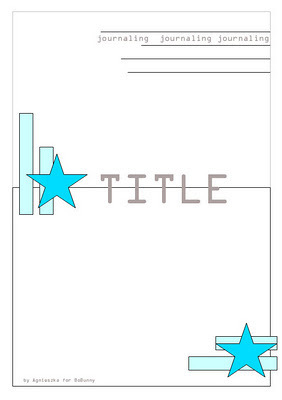 What an awesome post full of awesome projects, handsome boys, and winning scrappy news! You are on a roll, girl! Left you some blogging love at PS :) Your post totally cracked me up with all the different vision of trashiness, lol. Beautiful layouts and your boys look so handsome in their uniforms!